Members of the Philippine National Police Special Action Force conduct a raid to simulate an attack as part of heightened security efforts leading up to next week's APEC (Asia Pacific Economic Cooperation) Summit in Manila, Nov. 14, 2015. Philippine authorities preparing for this week’s Asia-Pacific Economic Cooperation leaders’ summit completed security simulations and placed the entire country on “full alert” a day ahead of schedule. They said the deadly attacks in Paris prompted them to start the exercises on Saturday instead of Sunday. Close to 130 people died in six separate attacks at crowded venues late Friday night.The Islamic State has laid claim to the mass shootings and suicide bombings. Philippine National Police spokesman Wilben Mayor said although the PNP, which is the lead agency heading up security efforts of 20 government departments, has “not monitored any specific or direct threat,” authorities have stepped up protective measures at seaports, airports and along the country’s railway system. “Every route, billeting areas of the leaders, the visitors, the delegates, every venue where it will be held, we will deploy personnel there- security personnel.We expect that as the event comes nearer, the tighter security will be,” said Mayor. The capital Manila will host leaders from 21 economies along the Asia Pacific and heads of state from 18 countries including the United States, China and Japan will be attending. The leaders’ summit takes place November 18 and 19. But this weekend, hundreds of international business leaders started attending meetings that will culminate in economic presentations with the heads of state at the later part of the week. 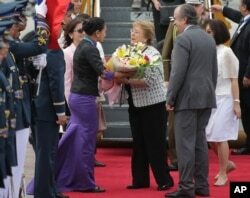 Chile's President Michelle Bachelet, center right, receives flowers as she arrives at Manila's international airport, Philippines, to attend the Asia Pacific Economic Cooperation (APEC) summit, Nov. 15, 2015. Mayor did not say how many police are being deployed. But he did say being on full alert status means personnel work 12-hour shifts at all police stations and at the general headquarters camp in metro Manila, swat teams and other special forces are ready for deployment. Throughout the day Sunday scores of police could be seen in clusters along the main routes and within the four-block radius of the main meeting venue. Armed Forces of the Philippines spokesman Restituto Padilla, Jr. said having the various scenarios earlier made a difference. Traffic was gridlocked during the weekend as motorists tried to adjust to the simulations, which included terror attack responses. They also contended with special “APEC lanes” designated only for heads of state and vehicles of delegates, on typically heavily traveled routes. The government has designated November 17-20 as special holidays for students and government workers. The private sector has the 18th and 19th off. Mayor said authorities were not yet sure, whether this would help ease traffic and they will be monitoring on Monday the volume of outgoing vehicles at two major highways to determine if roads will be easier to maneuver.